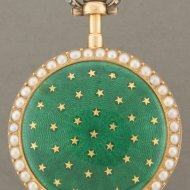 #4195 French Lépine virgule pocket watch with chatelaine and box. 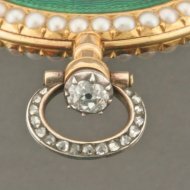 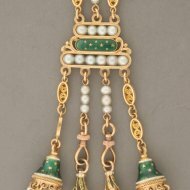 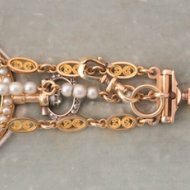 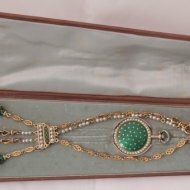 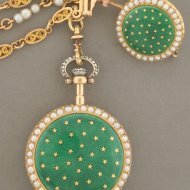 SOLD Gold enamelled case with pearls and diamonds, virgule-escapement, with original gold green enamelled chatelaine with pearl, key and lackstamp. 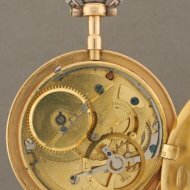 Lépine number 2043. 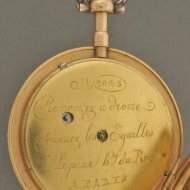 A similar watch withoud diamonds was given by Napoleon to Comtesse de la Bédoyère (collectie Chateaux de la Malmaison, see book 'Jean-Antoine Lépine, horloger 1720-1814' by Adolphe Chapiro). 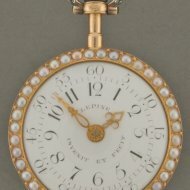 Diameter 38 mm. 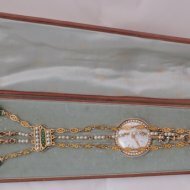 Box length 310 mm.